HEMPSTEAD, N.Y. — An Ecuadorian pizza deliveryman who was held up as an example of zealous U.S. immigration enforcement has been arrested in a domestic violence case. A criminal complaint alleges that Pablo Villavicencio pushed his wife against a wall, slapped her and grabbed her phone to keep her from calling police last Thursday at the couple's Hempstead, Long Island home. Villavicencio's lawyer, Bruce Barket, said the case against him is weak and that factual allegations didn't match the crime charged. "The criminal case is the kind of thing that really wouldn't make it two weeks in criminal court if it weren't for the attention," Barket said. "Let's see what happens." The Legal Aid Society, which represented Villavicencio in the immigration matter, said in a statement it was "hopeful that this matter will be resolved and that Pablo will secure valid status with the continued assistance of our counsel." "The past several months, including Pablo's detention and threats of imminent deportation, have been traumatic for the Villavicencio family," the organization said. Villavicencio was detained on June 1 after delivering pizza to the Fort Hamilton Army base in Brooklyn. At the time, Fort Hamilton said in a statement that when Villavicencio arrived on the base, he signed a "waiver permitting a background check, Department of the Army Access Control standard for all visitors, an active Immigration and Customs Enforcement warrant was discovered on file." Villavicencio was seeking to establish legal residency and overcome a 2010 order to leave the country. 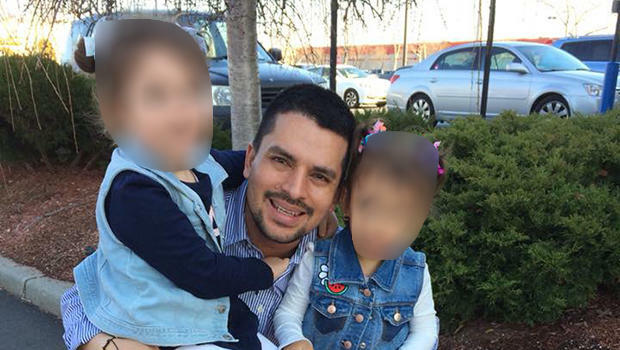 His wife and two young daughters are U.S. citizens. Villavicencio's arrest led to an outcry in New York, and was condemned by local elected officials. When he ordered the release of Villavicencio over the summer, U.S. District Judge Paul Crotty said he didn't believe the detention was "accidental or random." "It should not be difficult to discern that families should be kept together rather than be separated by the thoughtless and cruel application of a so called 'zero-tolerance' policy," Crotty wrote. "This is especially so where the organization seeking removal has also provided a pathway for a person in petitioner's position to regularize his immigration status with minimal disruption to his family life." The judge added Villavicencio "deserves it due to his hard work, his dedication to the family, and his clean criminal record." "The federal government is admitting what we already knew — there was absolutely no legitimate reason to lock Mr. Villavicencio up and take him away from his family," Gov. Andrew Cuomo, a Democrat, said at the time. The governor's office did not immediately respond Monday to phone and email requests for comment. Attorney General Jeff Sessions ordered the "zero-tolerance" policy in April. More than 2,500 children were separated from their parents after the Trump administration adopted the policy to criminally prosecute every adult who entered the country illegally. Hundreds of parents were deported without their children. President Trump signed an executive order halting the "zero-tolerance" policy in June, but is considering new options to create deterrents for immigrant families coming to America.